The stats suggests that a few of you are interested in the Ballard to West Seattle light rail alignment in ST3. Your first shot to ask questions directly of agency staff is coming up in a couple of weeks. Can’t join us in-person? Our online open house goes live on Feb. 12: wsblink.participate.online. There are several open debates on this alignment. Beyond the issues discussed at the link, Rob Johnson has expressed a desire to move the Ballard station west of 15th. In any case, the wish list generally costs money. Sound Transit hasn’t shown much inclination to let the schedule slip to take on some of these desires. The overall project budget, though fairly conservative at the time, is threatened by both a volatile federal administration and a Washington Legislature inclined to raid ST’s budget to fund tax cuts. The decision process is supposed to wrap up in the next year or so. This confluence of conditions is not good for people who hope to broaden the scope. 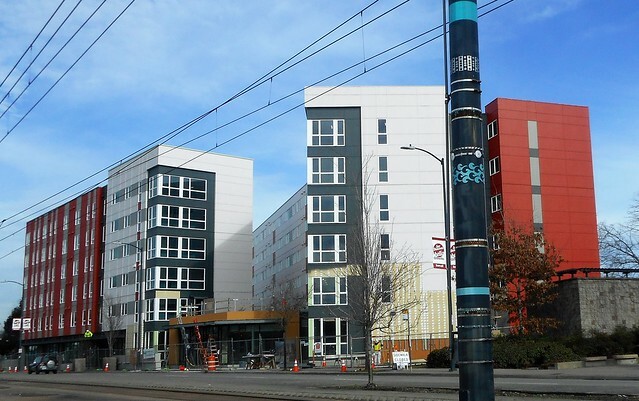 Affordable housing near transit is win-win for both housing and transit. If we build enough of it, not only will residents of this housing have lower rents, but the housing market as a whole will stabilize and improve. Meanwhile, transit riders will benefit from the positive feedback of more riders leading to more service and more support for transit improvements. The Housing for All Coalition (including Housing Now) is re-launching our campaign for a tax on big business that would raise $150 million a year to build thousands of affordable homes. This tax would go a long way towards funding the affordable housing we need and reinforcing Seattle’s transit oriented future. We hope you’ll join us tonight at 6pm at the Seattle Labor Temple 2800 1st Ave, Seattle, Washington 98121. For more info and to RSVP, check out the event page. Additionally, Housing Now is starting a new effort to reform Seattle’s comprehensive plan. We’re looking at moving from an “urban village strategy” that confines housing, to a “welcoming communities strategy” that supports and promotes abundant housing. We’re having a general interest meeting on Feb 18th, and we hope to see you there! We need your support for both of these efforts, see below for more information on why both are important and how you can get involved! The future Bellevue Downtown Station is scheduled to open in 2023. This post is the first in a series STB is launching to explore how suburban cities around the region are preparing for light rail. 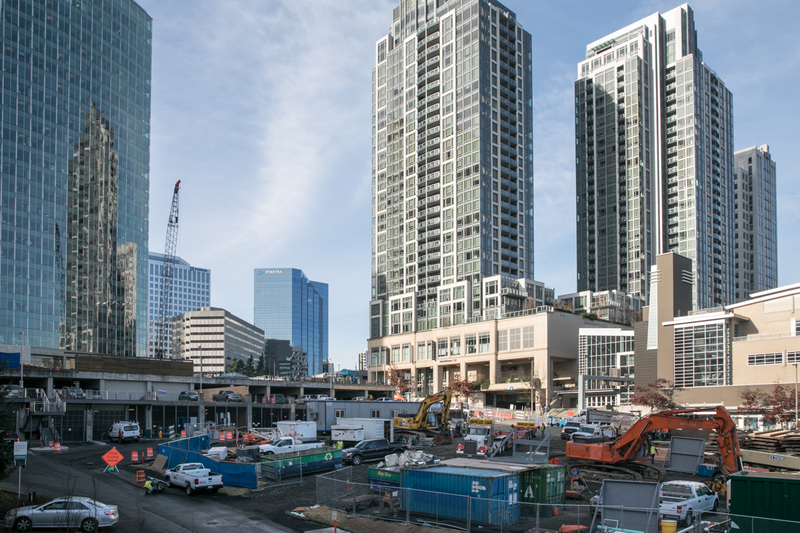 In 2017, the East Link Extension began taking shape as Sound Transit contractors prepared Interstate 90 for light rail and installed the first girders for the elevated track in Bellevue. 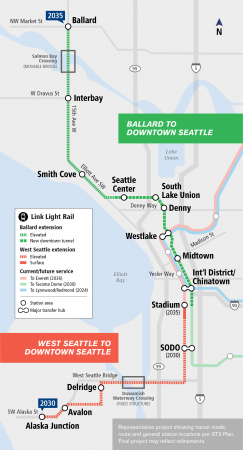 This year, ST is scheduled to start construction on the Lynnwood Link Extension to bring light rail north to Snohomish County. To many Eastside commuters, the 2023 opening can’t come soon enough. But the structure of many of these suburban cities — particularly their sprawling, low-density construction — is not conducive to efficient transit systems. 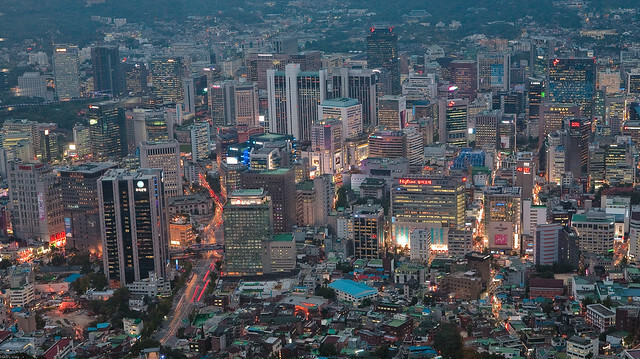 To leverage this massive infrastructure investment as it expands, cities must make sizable changes to their urban forms to integrate the transit system. 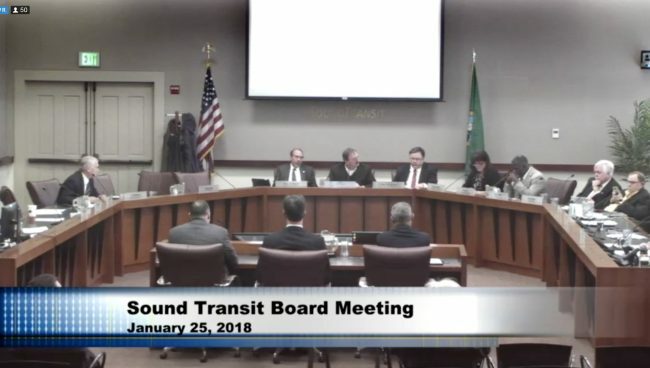 State Senator Steve O’Ban (R-Tacoma) continued his pursuit of a directly-elected Sound Transit Board, grilling lobbyists defending the transit agency’s current governance during a public hearing on Senate Bill 6301 Wednesday. But now that a Democrat chairs the Senate Transportation Committee, it’s not likely the bill will even get a vote in that committee. A similar bill, SB 5001, passed the Republican-led Senate in 2017, but the House Transportation Committee didn’t act on the legislation. Sen. Steve Hobbs (D-Lake Stevens), who chairs the Senate Transportation Committee, said he didn’t see the bill going anywhere. The public testimony did not convince him a directly-elected board was needed. Currently, the 18-member Sound Transit Board is comprised of 17 locally-elected officials appointed by each county executive and subject to approval by the county council. The State’s Transportation Secretary also sits on the board but is a non-voting member. Ten of the board members must be from King County, four from Pierce County and three from Snohomish County. SB 6301 would replace the current board with 11 members elected from single-member districts, with the first election held this November. To draw the lines for the 11 districts, the governor would appoint five members, who represent all five sub-areas, to a districting commission. If you have been down to Angle Lake Station lately, you may have noticed signs attached to the ORCA readers announcing a new bus route: King County Metro Route 635, the Des Moines Community Shuttle. 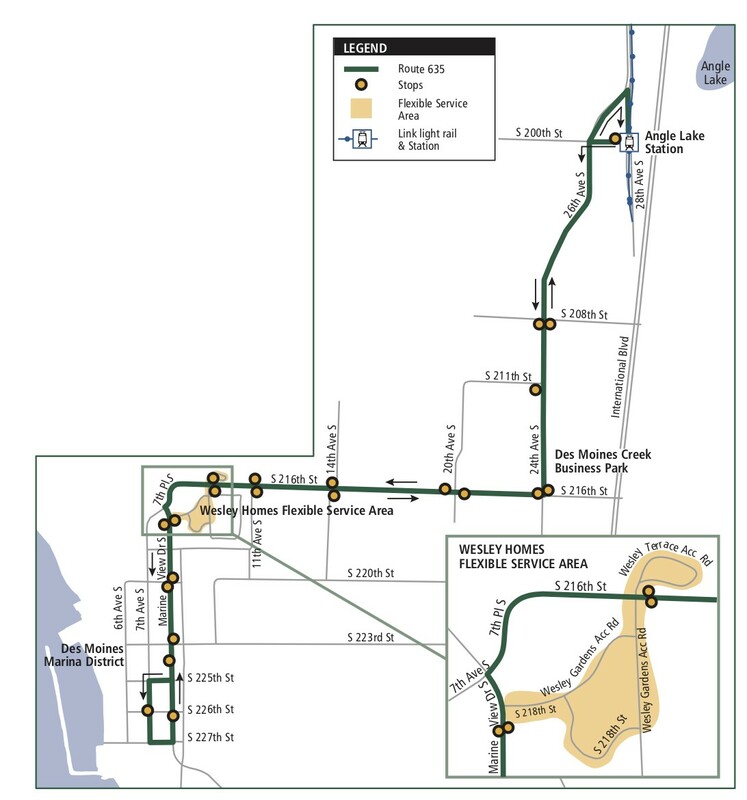 Starting today, the new route runs between Angle Lake Station and the Des Moines Marina District, picking up westbound at 200th St below the station, and serving ten more stop pairings, along 26th Ave S / 24th Ave S, S 216th St, and Marine View Dr S.
26th/24th features the Des Moines Creek Business Park, which opened in 2016, and includes office buildings for AmerisourceBergen, Greencore, Partners Crackers, XPO Logistics, and the new Federal Aviation Administration regional headquarters. The office park is expected to have roughly 2500 on-site employees, including 1600 at the FAA, per King County spokesperson Scott Gutierrez. Follow the path of Link tunnels under the UW from Husky Stadium to U District Station. The collision count is from 5pm in December 31st of the listed year to 5am on January 1st. Of course, there’s missing context here. The city’s Department of Special Events didn’t respond to my request for crowd estimates, which is the denominator of the numbers above. Metro said 160,000 people boarded a bus on NYE 2017, compared to 170,000 in 2016 and 300,000 in 2015. But that difference is almost certainly due to 2017 being a Sunday, while 2016 was a Saturday and 2015 a Thursday. The 160,000 figure is “about 17 percent more than average Sunday-service ridership in fall,” according to spokesman Scott Gutierrez. The nice thing about no-fare days during major events is that we get a lot of the benefits of free transit without the downside (significant lost revenue). No one is going to skip buying a pass because of the holiday, but riders don’t have to deal with a flood of new (and drunk) users struggling through fare payment. If there were a way to make buses like a newspaper paywall, where the first few trips of the month are free, that would be a revenue and operations sweet spot. But quite aside from the safety impacts, it’s good to take advantage of these sorts of opportunities when they occur in the calendar. Back in 2016, I wrote a couple petulant whines about the failure to make optimal use of escalators at Capitol Hill Station and UW Station. My screeds have so far gone unheeded. 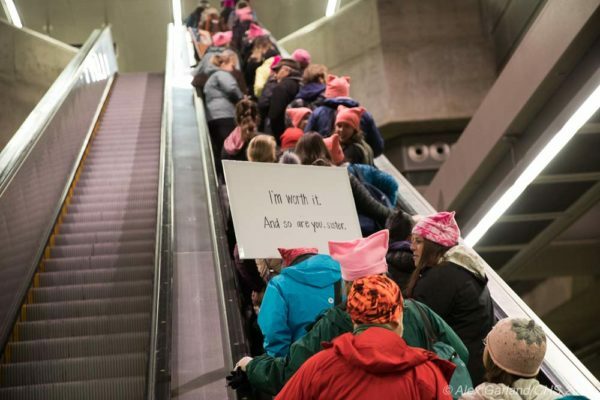 Last Saturday morning, as thousands of march attendees took the train to Capitol Hill Station, the up escalators leading out of the station were a bottleneck. On top of that, extra trains were arriving from both directions, with the vast majority of their passengers alighting, filling up the platform much faster than any evening peak rush, over an extended period. The small handful of passengers trying to get down to the platforms had mostly-empty elevators available at each end of the station. They had no need of the escalators, and they were not using them. 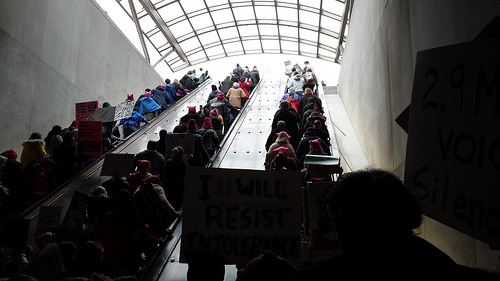 The left escalator was in service, but with nobody using it, before the Women’s March. 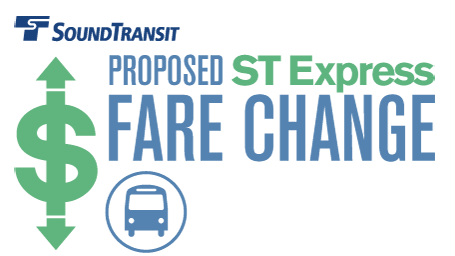 Sound Transit has rolled out a survey offering 2 options for restructuring ST Express bus fares. Both options would institute flat reduced fares ($1.50 for low-income and youth riders and $1 for Regional Reduced Fare Permit holders), getting rid of the de facto county line surcharge for each of these payer categories. This is the first low-income fare reduction on any transit service, anywhere in the country, beyond the low-income fare set at implementation of a low-income fare category. Option 1 would institute a $3.25 regular adult flat fare, splitting the difference between the current $2.75 single-county fare and the $3.75 multi-county fare. While many in the State House have been in a rush to assuage car drivers angry at being taxed more, and trample on Sound Transit’s ability to build the ST3 capital program, one Republican representative has offered a bill that uses some of the lenses we’d expect from Democrats to craft a more economically-progressive twist to altering the Motor Vehicle Excise Tax formula, albeit only impacting Sound Transit’s portion of the MVET. 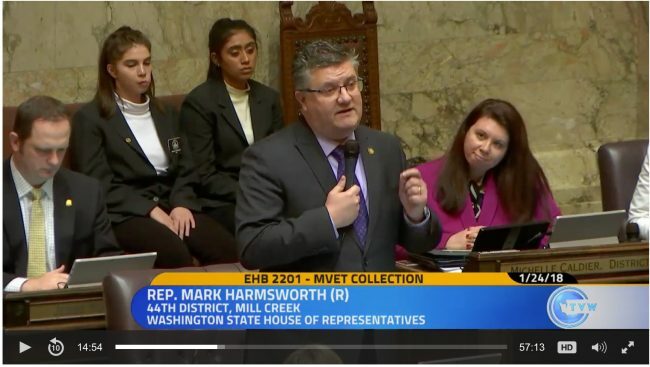 House Bill 2825 would provide graduated partial ST MVET exemptions based on the existing state property tax exemptions detailed in the Revised Code of Washington Section 84.36.381. To qualify, a person has to be at least 60 or unable to get gainful employment due to a disability. Due to how the bill references the property tax exemption, the person also has to be a property owner (which can include owning one’s condominium or part of a cooperatively-owned property). The exemptions would be 20%, 35%, or 60% of the MVET due based on income. Qualifying property owners earning less than $30,000 would get a 60% break on the ST portion of their MVET. Qualifying property owners earning $30,000-$35,000 would get a 35% break on the ST portion of their MVET. Qualifying property owners earning $35,000-$40,000 would get a 20% break on the ST portion of their MVET. The bill’s three obvious weaknesses are that those not owning property don’t qualify for the exemption; that no replacement revenue source is being offered to Sound Transit; and no other entities would have to take a hit on their MVET collection. 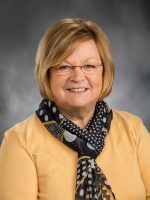 No fiscal note for the bill is expected until it is granted a hearing in the House Transportation Committee, which is not guaranteed to happen. Meanwhile, back over in the Senate Transportation Committee, several bills directed at Sound Transit are being heard this coming Wednesday afternoon at 3:30, including a couple bills by Sen. Steve O’Ban, and SB 5955, a bill sponsored by several Democrats that would give car tab payers a “credit” based on the difference between the valuation method used in 1996 and the current car tab valuation. The bill will get a makeover in committee, as it was submitted last year, when there was a different balance of power in the legislature. 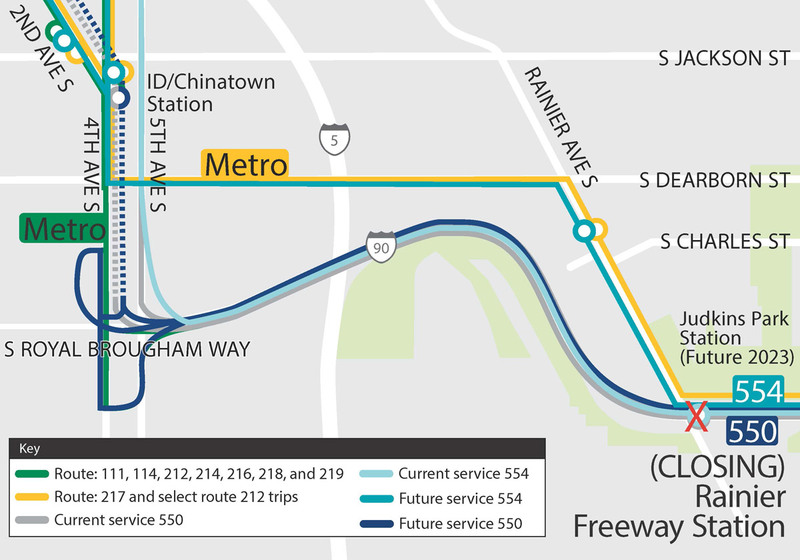 King County Metro Transit and Sound Transit released the September 2018 service changes to I-90 bus routes, prompted by the closure of the Rainier Freeway Station. 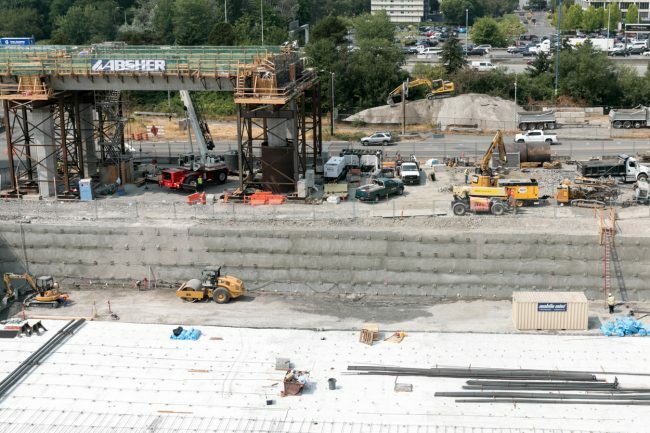 Construction of Judkins Park Link Station, part of East Link, requires the closure of the Rainier Freeway Station and the I-90 bus ramp that connects buses to the Downtown Seattle Transit Tunnel (DSTT). The East Link Extension and the Judkins Park Link Station are expected to begin operation in 2023. Changes to the bus routes are scheduled to take place September 22, 2018. 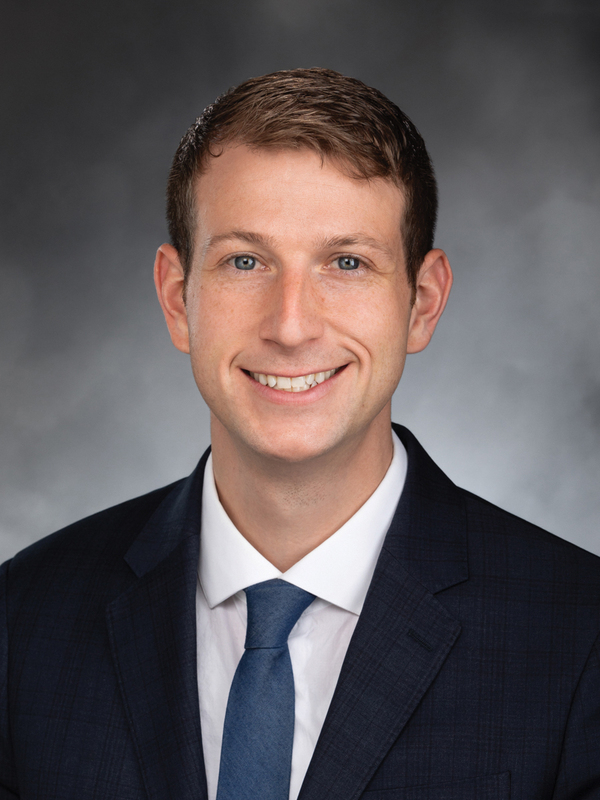 Last week, State Representative Joe Fitzgibbon introduced House Bill 2403, which would add transit-only lane enforcement cameras to the list of automated traffic safety cameras authorized for use in the state. The bill provides the process for enacting local ordinances for transit-only lane cameras, but sticks to existing language governing the use of such cameras. 1. to detect running red lights. 2. to detect illegal railroad crossings. 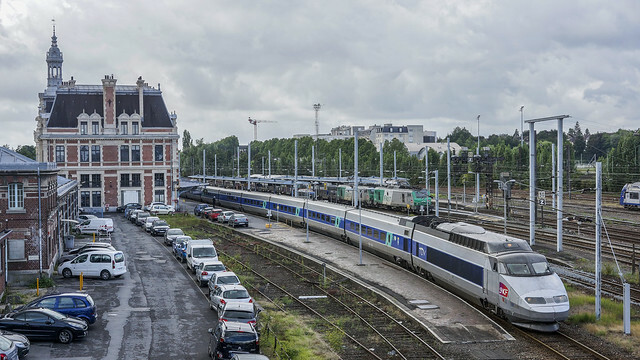 How Much Would High Speed Rail Actually Cost? Earlier this year, Seattle Transit Blog covered possible routes for high-speed rail (HSR) to Vancouver. Zach Shaner wrote the first two parts, and I wrote the last two. In December, Washington State DOT (WSDOT) released a study about the possibility of HSR in the Pacific Northwest. The study is bearish on HSR, with high cost estimates and unusually low operating performance—but the numbers themselves are suspect, suggesting a unit conversion error. 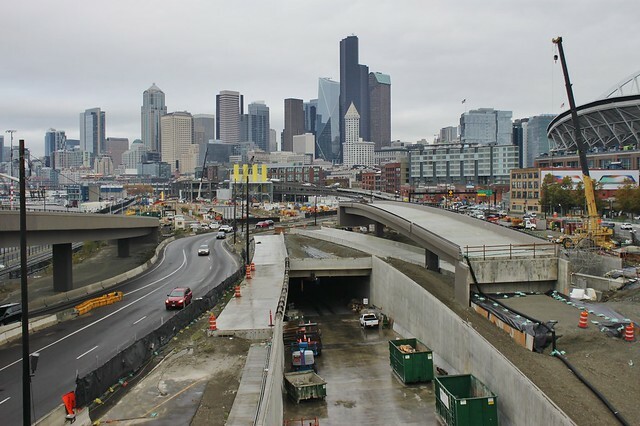 WSDOT says that the numbers in the study are right—but there is cause for skepticism. If the numbers are wrong, the entire study must be redone, and would point to a more positive conclusion about the prospects of HSR. Train departing Angle Lake Station. (Image by author). Here’s the idea in a nutshell. Revise the valuation schedule for the MVET, per HB 2201, so that the ST3 MVET (0.8%) is levied on the more accurate 2006 schedule. Pay for it by extending the Sound Move MVET (0.3%) that is otherwise scheduled to expire in 2028. The extended 0.3% MVET can use the 2006 vehicle schedule too, and can be set to expire once the funding gap is made whole. 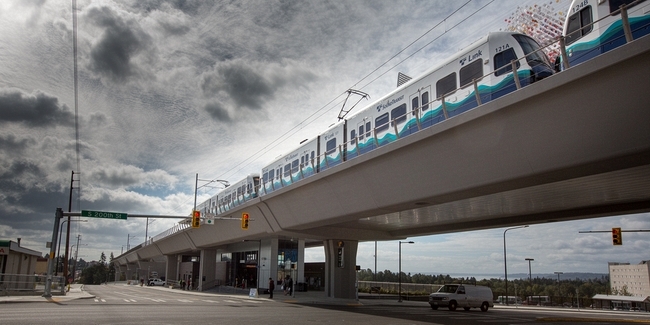 Sound Transit’s ability to deliver voter-approved projects on time will not be impaired. Car owners will see an immediate tax cut, offset only by a delay in the expiration of the Sound Move MVET after 2028. 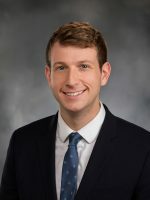 Democratic legislators are reexamining legislation that would lower car tab fees, reducing funding for Sound Transit and potentially delaying the expansion of light rail around the region. According to the News Tribune, State Sen. Marko Liias, (D-Lynnwood) said the party is looking at a range of ways to lower car tab fees, but also limit the hit to Sound Transit’s bottom line. Last week the House tabled plans to vote on HB 2201, which passed easily out of the chamber last year with both Democratic and Republican support. The bill adjusts the rate of the motor vehicle excise tax Sound Transit collects. ST3 uses a motor vehicle excise tax schedule from the 1990s, which many have criticized as inflating the value of cars and increasing the cost of renewing car tabs. If passed, ST estimated the agency would lose $780M in direct funding over the next 11 years, with indirect financial impacts, such as higher debt costs, costing Sound Transit nearly $2.3B. Voters passed the $54 billion transit package in 2016.